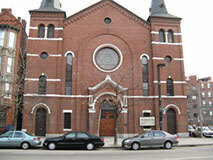 Boston’s South End was home to an early Jewish community between the 1840s and the 1920s. Our tour leader, Robin Dexter, will take us to some formerly Jewish and now historic sites and will discuss the history of the South End. Several of the early synagogue buildings still stand, though their uses have changed.